Instead of sitting down every day to write your posts, become friends with the scheduling feature that’s available on Facebook Business Pages. Now you can block off some time and schedule a week’s worth of posts by simply choosing what day and time they should appear. (Don’t guess – use your page analytics to determine the best time to post on your Page. Read my blog post: How Can I See When my Page Followers are Online?) There’s still work involved with the writing and finding a photo to accompany your posts but by dedicating a block of time each week and referencing your calendar for themed ideas, social media posting will become much more enjoyable. If you want to cross-promote your business across multiple platforms, try using third-party scheduling software such as Hootsuite, Buffer, or Cinchshare (Use this link and PROMO CODE: CSFREE to get 37 days FREE!). You can manage all your social profiles in one place as well as schedule all your posts. To avoid being labeled a “spammer,” switch up the words in each post while keeping the same overall theme. Think about how much more enjoyable your vacations will be when you can schedule social media posts before you even leave your home. Free Up More Time: Hire a Social Media Manager or Assistant. I know it’s hard to give up control of business tasks but if you really want to grow your social following, it’s time to hire a social media manager. The benefits are plentiful: you eliminate stress by delegating to an expert; social media managers can offer posting strategies for growing your audience; you can now focus on money-making tasks. Not only will social media managers strategize with you, but they can also take over the actual content creation as well as engage with your followers. Of course, you personally need to also interact with your audience but your manager can help while you’re working on your book or preparing your next presentation. We offer these services to our clients, please contact me if you’d like to discuss our social media service packages. If your budget right now doesn’t allow outsourcing, don’t despair. 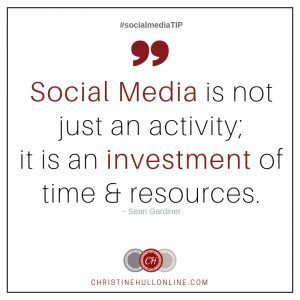 Plan your posts, schedule them according to plan, and remember to engage with anyone who comments or asks questions. If you are looking for ways to get higher engagement from your audience, I encourage you to read this blog: 8 Tips for Higher Engagement on your Facebook Posts or watch this video.